Welcome APOD and Sky and Telescope readers. This post was written while MagAO was mounted on the Clay 6.5 m telescope, and we post daily updates throughout the run on the main page. You can also find out about some of our scientific results using the In The News and Results pages. You can also read about our eyepiece observations in a post by Tom Beal at the Arizona Daily Star. On our first night on-sky in 2015A, our infrared camera Clio wasn’t quite ready to mount on the telescope. We also needed to test operating the AO system with a different camera, since there are several new instrument concepts in the works (Clio’s entrance window is the dichroic which sends light to the Pyramid and VisAO). The result of these fortunate circumstances is that we mounted the eyepiece for the very first time. Laird presents the MagAO eyepiece. It is mounted where Clio normally goes. The night started out poorly. It was cloudy, a guider communications cable failed deep inside the telescope, and one of VisAO’s hard drives failed. The telescope staff went to work on the cable, and Jared tore apart the VisAO electronics. Meanwhile, Laird was doing some last minute alignment checks on the eyepiece. At around midnight, all the problems were fixed and the sky magically began to clear. Once we opened, we immediately pointed at alpha Centauri A which is a very bright star and so makes a good alignment target. Working out on the platform in near freezing temperatures, we moved the MagAO Pyramid wavefront sensor around until it was aligned to the star with the eyepiece dichroic. Eyepiece alignment was done on the platform. At left is a cellphone image of alpha Cen A&B imaged on a card through the eyepiece. At right is the simultaneous image on the VisAO camera (on a laptop screen on the platform). These are open-loop images (before we turned on the AO). Then, on the first try, we closed the loop at 1000 Hz controlling 300 modes. Proof that the loop was closed while we were observing. At that point, we were observing the alpha Centauri system at the diffraction limit of a 6.5 meter telescope! Luckily the moon was out, giving Yuri Beletsky plenty of light to document the whole thing. The eyepiece had a very red filter installed, passing wavelengths longer than 685 nm. This means the sharpest details in the image were as small as 22 milli-arcseconds. We’re pretty sure that this is the highest angular resolution image ever formed on a human retina. We compared what we saw to images recorded on the VisAO science camera at nearly the same wavelength, and it was very gratifying to see the similarities. Katie tried her hand at drawing the image. You can see the 22-milliarcsecond core of A, the control radius around A, the chromatically elongated speckles, some atmospheric dispersion is evident, and you can see that anisoplanatism is affecting the image of B. During the night, 9 people looked through the eyepiece. 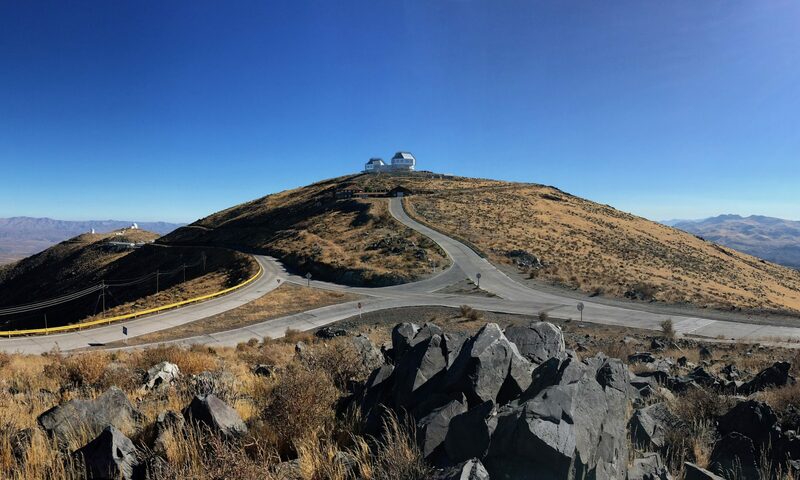 These astronomers are the inaugural members of an exclusive club: “L’Ordine degli Astronomi al Limite di Diffrazione” (The Order of Astronomers at the Limit of Diffraction). In this moonlit timelapse you can see most of them take their turn. Special thanks to Yuri Beletsky for documenting this great night.